Press release: e-Up Unified Perspective, global leader in the field of #visuanalysis, today announced that it has achieved Gold Partner status in the Oracle Partner Network (OPN). We are looking forward to a closer collaboration with Oracle and its great Siebel team towards new areas of innovation. To celebrate the news, Manuel Breschi, ceo @ e-Up announced: "We are very excited to deepen our collaboration with Oracle and the Oracle Partner Network with the gold membership. e-Up is committed to introduce again very exciting innovations to its flagship product, e-Tools, that will go along the new Oracle commitment to Siebel and extend it towards other Oracle solutions. To celebrate this event, we have made available further space on our cloud to allow for free trials for selected companies." Stay tuned for more innovation in the Siebel ecosystem! In July 2014, we launched a survey aimed at shedding some light on Siebel professional practices. 72 professionals have answered the research questions. If you would like to contribute you can do it here. This is the second extract of survey results, the first data analysis report is available here. The second part of the research focused on the tasks of Siebel implementation team members and their workload. Starting from domain literature and experts’ input, we extracted the most common tasks for each role on the project. In the survey, we asked the participants to asses how much time they spend on each of these tasks in percentages. The overall project time is 100%, while each task is assigned a percentage value depending on the participant’s experience. The data and graphs below are based on the average calculated from the participant’s answers. Let’s have a look a the results for Business Analysts (BA) and analyze them (other roles will be covered in following posts). The BAs participating in our survey spend most of their working time (in Siebel projects) eliciting requirements (18% of time); gathering requirements and modelling requirements are also important (each 16%). Interacting with technical team members occupies 14% of the time while interacting with the business side 9%. Understanding the already available functionality (the underlying system) use up to 12% of BA’s working time. Documenting requirements, after they have been gathered and modelled, takes 8% of their time. Up to now, there has been little (none?) support for Siebel BAs in terms of ad-hoc tools. With the advent of e-Tools, things are changing: the BA workload can be reduced up to 54%. - Support requirements elicitation - This is the most time consuming task and one that always got very little support. e-Tools facilitates interaction with end-users: Siebel UI navigation combined with #visuanalisys and automated modeling is the perfect companion for a BA to interact with business users. - Gather and model requirements - e-Tools supports requirements definition and modelling: visual diagrams are, in fact, the best way to understand and share requirements. Moreover, e-Tools allows you to attach any previous documentation and additional materials directly to the model objects. - Automated system analysis - You just need access to the Siebel application and you can get an automatic #visuanalysis of all existing functionality and customizations. This facilitates BA’s understanding of the application structure and behaviour. - Facilitate communication with technical team and business users -Tools allows project stakeholders to use the same language via a visual approach. 100% of BAs participating in the survey consider visual representations useful in interacting with the business side as well as with the development team. e-Tools employs a visual approach for requirements reducing misunderstanding among all stakeholders from final users to developers, testers, architects and support. - Automate documentation - quick 8% gain! Using e-Tools, once the requirements are modelled they can be automatically documented in html, ready to be shared. - requirements gathering and modelling down to 9.6% and 8% respectively (from 16%, which totals a 14.4% gain). Another area that benefits from using e-Tools is the interaction and communication with the technical team. In this case, the workload is cut by 8.4%, thus reduced from 14% down to 5.6%. The graph below describes the overall impact of using e-Tools for a BA working on a Siebel project. In the next post, we will cover the Developer workload research results, stay tuned. Siebel HI and IE - 2 relics of the past? Microsoft is moving away from Internet Explorer and focusing on Spartan, its new browser, based on a new rendering engine, dubbed 'Edge', to replace the "old" Trident-based Internet Explorer 11. Although IE will still be available in Windows 10, it is no longer going to be Microsoft primary browser. While these changes are imminent, enterprise users will still be working with IE for a while. Siebel customers are no exception (until they move to Open UI) and they know it very well, I would add. As you might already be aware from some articles around, for those of you that are stuck with old technology that is not HTML 5 or CSS3 compatible, Microsoft has made available the Enterprise Mode feature in their Internet Explorer 11. The drawback? You need administrative rights and have to follow a tedious process to customize your environment with the risk that this might not work well for your application. e-Up is making available a free IE browser that can be used for testing your Siebel HI in an IE11 environment. The solution works on both Windows 7 and Windows 8. The browser will come with a limited time period that should be enough for you to test your Siebel application - if you need some extra time, just let us know. This is a completely free service that we are offering to any Siebel customer/user, because we believe that the Siebel ecosystem lacks very much of this kind of initiatives that instead are available for other software, first of all cloud-based ones. Other good news is that no admin rights are necessary: neither for installing it nor for making the Enterprise Mode available. You won't need to change anything on your machine: no registry setting, no Group Policy access, no Administration work and above all no need for any pre-configured XML file containing the list of the websites for which you want IE11 to run in Enterprise Mode. All you have to do is just log in with your linkedin accout to www.e-up.pro, navigate to the Public Marketplace page and download the application. Launch the browser, navigate to your Siebel application, check the Enterprise Mode option and test away! If you want to share your experience with Siebel and IE11 in Enterprise Mode, we and the entire Siebel community would love to hear your experience. You can do so by posting on our community blog: in fact, entering our website with your LinkedIn credentials will also allow you to publish articles on the Blog. It's time everyone can easily contribute to the Siebel ecosystem in her own way. Please read the disclaimer at the end. We @e-Up are here to help Siebel grow - the right way. Follow Up on linkedin and twitter for more support and news. 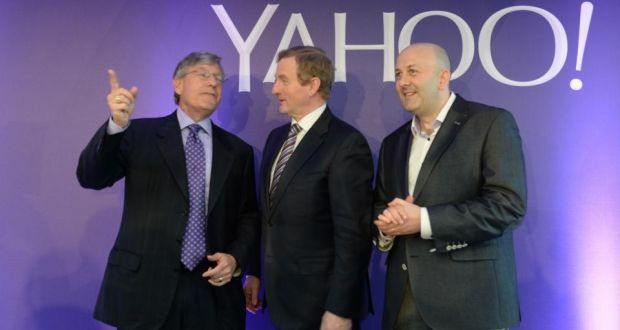 Yahoo has moved their European headquorters to Dublin's Point Village, becoming our next door neighbours. A warm welcome from the e-Up Team! e-Up, as Enterprise Ireland client, took part at the Trade Mission event in Cork and Galway: great events, looking forward to next ones! This summer we started a survey to better understand the current status of Siebel projects. Part of the results are presented in this article, with more information to come in future posts. It will be interesting to take the pulse of the situation after the release of IP2014 and all related new developments. From July to now, a total of 59 participants answered the survey questions. The survey is still open if you would like to contribute. All of the participants consider that a visual approach would be beneficial to the project. The majority of persons participating in the survey are working on Siebel version 8.1 or higher. Many of these applications are heavily customized. There are still projects where documentation is not required (despite software development methodologies insisting on it). Waterfall is still the main methodology used on Siebel projects, with Scrum/Agile expanding. Current project phase varies, with most projects being in Development (14) or Various / Ongoing streams (16) phases. Stay tuned for more results in future posts. Let us know your opinion: participate in the survey here. The 12th of November, e-Up joined other Oracle partners and customers at Croke Park for Oracle Open Day Dublin. IN ORDER TO USE THIS SERVICE OR ANY SOFTWARE PRODUCTS PUBLISHED BY e-Up, YOU MUST ACCEPT THESE TERMS AND CONDITIONS. YOU CAN ACCEPT THESE TERMS BY (A) BY CHECKING THE CORRESPONDING FLAG OR CLICKING THE "ACCEPT" BUTTON FOR THE AGREEMENT, WHERE THIS OPTION IS MADE AVAILABLE TO YOU IN THE USER INTERFACE, OR (B) BY ACTUALLY USING THE SERVICES, IN WHICH CASE YOU UNDERSTAND AND AGREE THAT e-Up WILL TREAT YOUR USE OF THE SERVICES AS ACCEPTANCE OF THE AGREEMENT FROM THAT POINT ONWARDS. IF YOU ARE ENTERING INTO THIS AGREEMENT ON BEHALF OF A COMPANY OR OTHER LEGAL ENTITY, YOU REPRESENT THAT YOU HAVE THE LEGAL AUTHORITY TO BIND THE LEGAL ENTITY TO THIS AGREEMENT, IN WHICH CASE "YOU" SHALL MEAN SUCH ENTITY. IF YOU DO NOT HAVE SUCH AUTHORITY, DO NOT AGREE WITH THE TERMS AND CONDITIONS OF THIS AGREEMENT, OR ARE BARRED FROM RECEIVING THE SERVICES UNDER THE LAWS OF THE REPUBLIC OF IRELAND OR OTHER COUNTRIES INCLUDING THE COUNTRY IN WHICH YOU ARE RESIDENT OR FROM WHICH YOU ARE USING THE SERVICES, YOU MAY NOT USE THE SERVICES. "Affiliate" means any entity controlling, controlled by, or under common control as evidenced by ownership or control of, either directly or indirectly, at least 50% of the outstanding voting securities of the relevant entity. "Agreement" means these Terms and Conditions, applicable Transaction Documents, Acceptable Use Policy, and any related attachments. "Acceptable Use Policy" means the document entitled "Acceptable Use Policy" published on the e-up.pro web site. "e-Up" means e-Up Unified Perspective Ltd., its Affiliates, or entities authorized by e-Up Unified Perspective Ltd. to provide a Service. "e-Up Products" means the software products owned by e-Up. "Customer" means the entity that orders the Services or Licensed Materials and is responsible for the payment of fees under, and compliance with, this Agreement. "Confidential Information" means any information disclosed previously or in the future ("disclosed" means any of information, of access to information, or of means to gain access to information) by either party to the other party, either directly or indirectly, in writing, orally, by inspection of tangible objects or otherwise (including, without limitation, research, product plans, products, services, customers, markets, software, inventions, processes, designs, drawings, engineering, hardware configuration information, marketing and finances documents), which are indicated by the party to be "Confidential," "Proprietary" or similarly designated, or which under the context of its disclosure ought to be considered confidential. Information communicated orally shall be considered Confidential Information if such information is identified as Confidential Information at the time of disclosure or if such information is confirmed in writing, including confirmation via email, as being Confidential Information within a reasonable time after the initial disclosure. Confidential Information may also include information disclosed to a disclosing party by third parties. Confidential Information shall not, however, include any information which (i) was publicly known and made generally available in the public domain prior to the time of disclosure by the disclosing party; (ii) becomes publicly known and made generally available after disclosure by the disclosing party to the receiving party through no action or inaction of the receiving party; (iii) is already in the possession of the receiving party at the time of disclosure by the disclosing party as shown by the receiving party's files and records immediately prior to the time of disclosure; (iv) is obtained by the receiving party from a third party without a breach of such third party's obligations of confidentiality; (v) is independently developed by the receiving party without use of or reference to the disclosing party's Confidential Information, as shown by documents and other competent evidence in the receiving party's possession or (vi) is required by law to be disclosed by the receiving party, provided that the receiving party shall give the disclosing party prompt written notice of such requirement prior to any disclosure so that the disclosing party may seek a protective order or other appropriate relief. "Licensed Materials" means each of the e-Up Products, Documentation and e-Up APIs, SDKs and any other e-Up software code designed to facilitate the integration or use of any e-Up Product or Service by the Customer. "License Agreements" means documents that set forth the description of the Services being purchased from e-Up and any additional terms set forth in any Order Forms, Statements of Work, or other documents executed by the parties. e-Up takes no responsibility for any Customer or User content created, accessible or delivered on or through the e-Up Network and Services. e-Up does not monitor or exercise any editorial control over such content. Customer is solely responsible for (i) any content published or made available through the e-Up Network or Services by Customer and its Users and (ii) compliance with all laws applicable to the publication and distribution of such content. Customer shall be solely responsible for maintaining a copy of its content. General. Each party shall perform its obligations as set forth in this Agreement. e-Up grants you a limited, nonexclusive, nontransferable, revocable license to use the e-Up products, Content, Files and Services subject to the restrictions set forth in these Terms of Service. Ownership. e-Up shall retain all right, title and interest to any patents, copyrights, trade secrets or other proprietary rights in the Service and Licensed Materials. e-Up may make changes to Licensed Materials or Service at any time without notice. No Resale. Customer shall not resell the Services to a third party nor enter into any similar relationship with a third party to enable the purchase or use of the Services or Licensed Materials through Customer. For purposes of the foregoing, end users accessing the Customer web site are not considered to be using the Services. When using the Services, Customer shall comply with e-Up's then-current Acceptable Use Policy as published at the e-Up.pro web site. No Modifications. Customer shall not modify, alter, tamper with, or otherwise interfere with proper functioning of the Licensed Materials or Service. Customer shall not remove, obscure, modify, or otherwise inhibit the full and complete display of any branding or proprietary marks in the Service user interface. Customer acknowledges that Licensed Materials may incorporate hardware- and Internet-based licensing mechanisms designed to prevent piracy of Licensed Materials. Customer grants e-Up the right to utilize such licensing mechanisms and shall not interfere with the proper functioning of such mechanisms. Access and Interference. You agree that you will not use any robot, spider, scraper or other automated means to access any e-Up product or service for any purpose without our express written permission. Additionally, you agree that you will not: (i) take any action that imposes, or may impose in our sole discretion an unreasonable or disproportionately large load on our infrastructure; (ii) interfere or attempt to interfere with the proper working of the site or any activities conducted on a e-Up product or service; or (iii) bypass any measures we may use to prevent or restrict access to the e-Up products or services. Account Registration and Security. You understand that you may need to create an account to have access various e-Up products and services. You will: (a) provide true, accurate, current and complete information about yourself and your business as prompted by the registration form (such information being the "Registration Data") and (b) maintain and promptly update the Registration Data to keep it true, accurate, current and complete. If you provide any information that is untrue, inaccurate, not current or incomplete, or e-Up has reasonable grounds to suspect that such information is untrue, inaccurate, not current or incomplete, e-Up has the right to suspend or terminate your account and refuse any and all current or future use of the e-Up product or service (or any portion thereof). You are entirely responsible for the security and confidentiality of your password and account. Furthermore, you are entirely responsible for any and all activities that occur under your account. You agree to immediately notify us of any unauthorized use of your account or any other breach of security of which you become aware. You are responsible for taking precautions and providing security measures best suited for your situation and intended use of the products or services. We have the right to provide user billing, account, content or use records, and related information under certain circumstances (such as in response to legal responsibility, lawful process, orders, subpoenas, or warrants, or to protect our rights, customers or business). Please note that anyone able to provide your personally identifiable information will be able access your account so you should take reasonable steps to protect this information. Payments to e-Up. Customer shall pay all applicable Service and licensing fees within thirty days of any invoice date. All prices are denominated in EURO and all payments shall be made in EURO currency. Taxes and Fees. Except where otherwise required by law, prices do not cover any taxes or duties, shipping and handling fees, or travel expenses. All such taxes, duties, and fees are the responsibility of Customer. There shall be no deduction from, or an offset against, any such taxes, fees, or other charges, and all payments shall be grossed up to account for any withholding taxes. Amendments. Unless otherwise stipulated in other amendments, the contents of this terms and conditions, the fee schedule for Services and Licensed Materials may be changed at any time at the sole discretion of e-Up, provided that if e-Up increases the fees then Customer shall have the right to terminate its purchase of the applicable Service without termination charge by providing written notice to e-Up within thirty days of the effective date of the increased fees. Late payment. Customer shall pay a late charge of the lesser of one percent per month (or part of a month) or the maximum lawful rate permitted by applicable law for all amounts not paid within thirty days of invoice date, plus all costs, including reasonable attorneys' fees, incurred to collect any unpaid amounts. Unless prohibited by applicable law or regulation, all invoiced amounts not disputed in writing within sixty days of the invoice date are deemed accepted. Restrictive endorsements or other statements on checks accepted by e-Up are not enforceable. e-Up reserves the right to reasonably require payment assurance. Confidentiality of the Agreement. The terms of any Transaction Documents and attachments, shall be treated as Confidential Information by the parties. Non-Disclosure of Confidential Information. Each party agrees not to use any Confidential Information of the other party for any purpose except in support of the activities contemplated in this agreement. Each party agrees not to disclose any Confidential Information of the disclosing party to third parties or to such party's employees, except to those employees of the receiving party who are required to have the information in order to evaluate or engage in discussions concerning matters related to this Agreement. Neither party shall reverse engineer, disassemble or decompile any prototypes, software or other tangible objects which embody the other party's Confidential Information and which are provided to the party hereunder. Maintenance of Confidentiality. Each party agrees that it shall take reasonable measures to protect the secrecy of and avoid disclosure and unauthorized use of the Confidential Information of the other party. Without limiting the foregoing, each party shall take at least those measures that it takes to protect its own most highly confidential information, and shall ensure that its employees who have access to Confidential Information of the other party have signed a non-use and non-disclosure agreement in content similar to the provisions hereof, prior to any disclosure of Confidential Information to such employees. Neither party shall make any copies of the Confidential Information of the other party unless such copying is previously approved in writing by the disclosing party. Each party shall reproduce the disclosing party's proprietary rights notices on any such approved copies, in the same manner in which such notices were set forth in or on the original. Ownership and Return of Materials. Any and all Confidential Information disclosed by either party hereto is and shall remain the property of the disclosing party. All documents and other tangible objects containing or representing Confidential Information, either in whole or part, which has been disclosed by either party to the other party, and all copies thereof which are in the possession of the receiving party, shall be promptly returned to the disclosing party upon the first of the following to occur: (i) the disclosing party's written request; (ii) the completion of the purpose for which it was provided; (iii) the determination by the receiving party that it no longer desires to possess the Confidential Information; or (iv) within thirty (30) days after any termination of this Agreement. No Additional Restriction. Nothing in this Agreement shall restrict the disclosing party from using, disclosing or disseminating its own Confidential Information in any way. Residuals. Notwithstanding the foregoing provisions of this Section 4, the receiving party will have the right to use and exploit Residuals, except that Residuals shall be subject to the same limitations on disclosure as the receiving party would impose on its own confidential information of like value. As used herein, "Residuals" means ideas, information and understandings that are retained in the memory of an ordinary person skilled in the art, not intent on appropriating the Confidential Information of the disclosing party as a result of his or her review, evaluation or testing of such Confidential Information. YOUR USE OF e-Up PRODUCTS AND SERVICES AND ANY CONTENT OR DATA ACCESSIBLE THEREON IS AT YOUR RISK. THE INFORMATION, PRODUCTS AND SERVICES MADE AVAILABLE ON OR THROUGH e-Up PRODUCTS AND SERVICES ARE PROVIDED "AS IS" WITHOUT ANY WARRANTIES OF ANY KIND INCLUDING WARRANTIES OF MERCHANTABILITY, FITNESS FOR A PARTICULAR PURPOSE, SECURITY OR NON-INFRINGEMENT OF INTELLECTUAL PROPERTY. NEITHER e-Up, NOR ANY OF ITS AFFILIATES WARRANT THE ACCURACY OR COMPLETENESS OF THE INFORMATION, MATERIALS OR SERVICES PROVIDED ON OR THROUGH ANY e-Up PRODUCT OR SERVICE. THE FOREGOING EXCLUSIONS OF IMPLIED WARRANTIES DO NOT APPLY TO THE EXTENT PROHIBITED BY LAW. PLEASE REFER TO YOUR LOCAL LAWS FOR ANY SUCH PROHIBITIONS. e-Up does not assume any responsibility, or will be liable, for any damages to, or any viruses that may infect, your computer, telecommunication equipment, or other property caused by or arising from your access to, use of, or browsing e-Up products and services, or your access of any information or materials via a e-Up product or service. e-Up does not guarantee continuous, uninterrupted or secure access to any e-Up products or services, and operation of the e-Up products and services may be interfered with by numerous factors outside of our control. LIABILITY ARISING UNDER THIS AGREEMENT SHALL BE LIMITED TO DIRECT, OBJECTIVELY MEASURABLE DAMAGES AND, TO THE EXTENT PERMITTED BY LAW, NEITHER PARTY SHALL HAVE ANY LIABILITY TO THE OTHER PARTY OR A THIRD PARTY FOR ANY INDIRECT OR SPECULATIVE DAMAGES INCLUDING, WITHOUT LIMITATION, DAMAGES FOR LOSS OF USE, LOSS OF DATA, BUSINESS INTERRUPTIONS, AND LOSS OF PROFITS, IRRESPECTIVE OF WHETHER THE PARTY HAS ADVANCE NOTICE OF THE POSSIBILITY OF ANY SUCH DAMAGES; PROVIDED, HOWEVER THAT THIS LIMITATION SHALL NOT APPLY TO A PARTY'S INDEMNIFICATION OBLIGATIONS, DAMAGES ARISING FROM A PARTY'S BREACH OF CONFIDENTIALITY, OR DAMAGES ARISING FROM A PARTY'S WILLFUL MISCONDUCT. NOTWITHSTANDING THE FOREGOING, A PARTY'S TOTAL COLLECTIVE LIABILITY TO THE OTHER PARTY UNDER THIS AGREEMENT SHALL NOT EXCEED THE TOTAL AMOUNT PAID TO e-Up BY CUSTOMER DURING THE TWELVE (12) MONTHS IMMEDIATELY PRIOR TO THE INCIDENT GIVING RISE TO SUCH LIABILITY, PROVIDED, HOWEVER, THAT THIS LIMITATION SHALL NOT APPLY TO A PARTY'S INDEMNIFICATION OBLIGATIONS, DAMAGES ARISING FROM A PARTY'S BREACH OF CONFIDENTIALITY, OR DAMAGES ARISING FROM A PARTY'S WILLFUL MISCONDUCT. In the event that you have a dispute with one or more other users of a e-Up product or service, you release e-Up (and our officers, directors, agents, subsidiaries, joint ventures and employees) from claims, demands and damages (actual and consequential) of every kind and nature, known and unknown, suspected and unsuspected, disclosed and undisclosed, arising out of or in any way connected with such disputes. NO ADVICE OR INFORMATION, WHETHER ORAL OR WRITTEN, OBTAINED FROM e-Up OR THROUGH e-Up PRODUCTS AND SERVICES WILL CREATE ANY WARRANTY NOT EXPRESSLY MADE HEREIN. Term. The "Term" for a Trial period shall not be more than 2 (two) weeks or 10 (ten) working days whichever is shorter. The “Term” for an acquired license is defined in the license agreement. Termination of an individual Trial shall not terminate any Services under other Service Agreements. Termination. Either party may terminate the services if the other materially breaches this Agreement and such breach continues unremedied for three days following notice or such other period designated herein. e-Up may immediately suspend all services for undisputed not received within fifteen days of payment due date. e-Up may modify components of any Service to the extent such change is made to the generally available Service and, in such event, may modify or eliminate any affected Agreement terms without termination charge upon three days notice, or a lesser period if such change or termination is due to applicable laws or regulations. Early Termination. Except for a termination by Customer as expressly permitted herein, if a Service Agreement is terminated prior to end of the Term for any reason, Customer shall pay e-Up a termination charge (which Customer acknowledges reflects a reasonable measure of actual damages and not a penalty) equal to 100% of the fees that would have become due for the remainder of the Term, in addition to all fees outstanding at the date of termination. Survival. Sections 3, 4, 6, 7, and 8 shall survive termination. Governing Law, Jurisdiction and Attorneys' Fees. This Agreement and all matters arising out of or relating to this Agreement shall be governed by the laws of the REPUBLIC OF IRELAND, excluding its conflict of law provisions. In the event of any litigation of any controversy or dispute arising out of or in connection with this Agreement, its interpretation, its performance, or the like, the prevailing party shall be awarded reasonable attorneys' fees and expenses, court costs, and reasonable costs for expert and other witnesses attributable to the prosecution or defense of that controversy or dispute. In the event of a non-adjudicative settlement of litigation between the parties, the term "prevailing party" shall be determined by that same process. The Courts located in Dublin County, IRELAND shall have sole jurisdiction over any disputes arising hereunder and the parties hereby submit to the personal jurisdiction of such courts. The U.N. Convention on the International Sale of Goods shall not apply to this Agreement. Notices. Except as otherwise set forth herein, notices made by us to you under this Agreement that affect our customers generally (e.g., notices of amended Agreements, AUPs, updated fees, etc.) will be posted on the e-Up.pro web site. Notices made by us under this Agreement for you or your account specifically (e.g., notices of breach and/or suspension) will be provided to you via the email address provided to us in your registration for the Services or in any updated email address you provide to us in accordance with standard account information update procedures we may provide from time to time. It is your responsibility to keep your email address current and you will be deemed to have received any email sent to any such email address, upon our sending of the email, whether or not you actually receive the email. * *For notices made by you to us under this Agreement, all notices shall be required to be sent in writing and shall be deemed to have been given upon the date it was delivered by courier or, if by certified mail return receipt requested, on the date received, to e-Up, Attn: IOANA CODOBAN, e-Up, 473 Suite Castleforbes Square, Castleforbes Road, Dublin 1, IRELAND. Force Majeure. Neither e-Up nor you shall be responsible for damages or for delays or failures in performance resulting from acts or occurrences beyond their reasonable control, including, without limitation: fire, lightning, explosion, power surge or failure, water, acts of God, war, revolution, civil commotion or acts of civil or military authorities or public enemies: any law, order, regulation, ordinance, or requirement of any government or legal body or any representative of any such government or legal body; or labor unrest, including without limitation, strikes, slowdowns, picketing, or boycotts; inability to secure raw materials, transportation facilities, fuel or energy shortages, or acts or omissions of other common carriers. Severability. In the event any provision of this Agreement is held to be invalid or unenforceable, the remaining provisions of this Agreement will remain in full force. No Agency, Partnership or Joint Venture. No agency, employment, partnership, joint venture, or other joint relationship is created hereby. e-Up and Customer are each independent contractors with respect to the other and neither has any authority to bind the other in any respect whatsoever. Assignment. Neither party may assign, transfer or delegate this Agreement or any right and/or obligation of the party hereunder to any third party hereto without the prior written consent of the other party. Notwithstanding the foregoing, either party may assign this Agreement and such party's rights and obligations hereunder without the consent of the other party to a subsidiary, parent, or entity under common control. In addition, either party may assign this Agreement, and its rights and obligations hereunder, to any third party that acquires all or substantially all of such party's stock or assets relating to that portion of such party's business that is related to the subject matter of this Agreement, provided that such party assumes all of the obligations of the assigning company under this Agreement. Any attempted assignment, delegation, or transfer in contravention of this Agreement shall be null and void. Oracle Sales Cloud with or without Siebel? Oracle Open World this year was interesting; just to mention one special: first software demo directly performed by Larry Ellison as CIO. But what was more interesting for me was how Siebel and Oracle Cloud are evolving. There are some key elucidations on how the two interact collected from the exhibition demos. The first natural question that popsup while watching the Sales Cloud demo was: what happened with Fusion? Well, if you check the Sales Cloud tab name you will see Fusion branding still displayed. So, yes, Sales Cloud is Fusion re-branded and with a simplified UI. First of all, Siebel and Sales Cloud have a process based integration. This means that part of the sales process is carried through in one and part in the other. The current version allows for a one-way data flow from the Cloud to Siebel. It means that in order to start using the Sales Cloud, one needs to perform an initial data load to populate it. Sales Cloud Release 9 (next one) will cater for bi-direction data flow. Sales Cloud is modeled on Siebel with corresponding “data maps”, facilitating integration. Only part of the Siebel objects are available in the Sales Cloud (Quotes, Opportunities and Pricing are not, for example). Additional objects (both standard ones not yet covered and custom ones from the on-premises Siebel) need to be built in the cloud and integrated via web services. But let’s have a look at what Sales Cloud can do for a sales representative. The way the demo-er put it was: Sales Cloud can do all the necessary basic tasks, but the heavy-lifting is left to Siebel. The pricing customization, workflows, complex calculation of discounts, checks on discounts and approval escalations are still just Siebel domain. However, it is possible to embed in the cloud the necessary Siebel views via some frames, facilitating the end-user process flow (no need to start a new application). With a little help from Open UI, the look-and-feel of the Siebel standard application could be customized so that the user does not even realize she is stepping into a new application when . But, this means customization and is not available out-of-the box. What convinces and attracts in using the Sales Cloud is the easy interface and reduced administration, I’ve been told. Of course, giving up administration comes at a price, as the control on the DB side (and the flexibility it provides for deeper customization) is lost. No additional license is required for the Sales Cloud, however check with your Oracle representative and also the small print, just to be on the safe side. The interface is looking quite good and I can see how sales representatives could be enticed by it. However, the many customer presentations on OpenUI at the OOW14 have mesmerized me. With IP2014, Siebel can look really great and above all have a full responsive design. User Interfaces as beautiful as any fancy website or cloud application, if not better, and, moreover, less customization requirements due to the adaptive responsive design (no more need for specific css based on the used device). One of the cases presented was a mobile application entirely based on Siebel Open UI, working on tablets/iPads and phones: stream-less process, beautiful UI, powerful support. It makes a Siebel professional dream of possibilities. So, back to our question: Sales Cloud with or without Siebel? Without Siebel, the Sales Cloud can’t support a complete sales life-cycle. On the contrary, Siebel with Open UI provides simple UI interaction with full support and, thanks to the newest IP2014, the mobile version can handle synchronization with the server in a real smooth way, without interrupting the sales representative work. In order for Sales Cloud to be operational from a functional point of view, dedicated development and customization are required. Oracle demoers recon that Sales Cloud is meant to be used by sales people outside of the company, while Siebel remains the internal sales people support. The Siebel mobile from IP2014, with the new OpenUI (and adequate browser) answers all the end-user requirements for an intuitive and practical user interface that is also beautiful. As Oracle is pushing more and more on Cloud marketing and PR, many of us expected a lot from the Sales Cloud and related solutions. But we will need to wait (probably) for a full out-of-the-box integration and all the functionality that we currently have on-prem to be available in the cloud. During OOW14, I’ve heard Oracle customers asking (themselves and others) what should be the next move: Cloud or OpenUI? These are very different approaches as Cloud is a shift in paradigm while OpenUI is an extension of the current one. You can find more considerations here. In the meanwhile, I’m still thinking of the possibilities OpenUI offers such as seamless mobile applications. If you are working with Open UI, have a look at e-Tools and how it's V3 can help you out, check the free Beta Enrolment to see if you are eligible. Let us know your experiences and opinions. Are you planning to leave Siebel for some other technology?.. Think twice..
As e-Up is attending the Oracle Open World 2014, today I attended the “Siebel CRM - the future of Siebel, Strategy and Roadmap for the World’s most complete CRM” session. I have to say that after years of frustration, now Siebel customers could relax about the future of their multi-years investment, if Oracle keeps its promises. As I have had the opportunity to underline in other occasions, the strategy towards what they now define as the most complete CRM solution in the World, has been ambiguous - to say the least. During these days, I have met Siebel customers really expressing years of frustration towards a non clear statement of direction, making confusion even between going to Open UI or Oracle Cloud (by the way - someone still talks about Oracle Fusion applications and you would be surprised by who is doing so..). What we have been experiencing in these years is a constant and continuous penetration of the cloud buzzword in the business applications scenario. Cloud is cool, On-Prem is obsolete... Or so they say. So we have seen Siebel customers abandon their investment for other technologies, quite always towards cloud based ones as Salesforce.com or Sugar CRM (as in the famous IBM case). But are we really sure they did the best long-term decision? Siebel customers are still very concerned about their commitment to their Siebel solutions and they are not sure if continuing investing in it is a winning strategy. If until today I had my own idea about the right choice for big corporations, but I could not reassure them (at the end of the day, we do not own the future of Siebel as a technology) now I can honestly say those customers that they should be relaxed and not too much worried about the future of their CRM platform. What really changes between Cloud and On-Prem solutions is the commitment you are giving to handling your own data and servers. If taking care of your servers and data is more a burden than an advantage, then you should probably think about a strategy to get rid of it and find someone to take care in your place or change the entire application paradigm and move everything to the cloud. If you are not part of this group, then I don’t think you should be concerned about not being yet on the cloud. As technology is improving, as network speed and bandwidth are increasing, the difference among the different paradigms is really more and more a keyword, marketing one. But I will return on this in the future, discussing how we simply deliver to you new solutions like e-Tools for Siebel. What I want to give you is really my impression about the market and my opinion about the most intelligent way to face the future. My impression is that someone has tried to put on-prem solutions as Siebel apart, but many customers were not ready or not willing to follow the flow. The consequent lack of customers satisfaction and the evolution of technologies I mentioned before brought us where we stand today, with Oracle telling us they are going to commit to Siebel for the most foreseeable future with a bunch of new implementations I am going to list. Again, if you are not in the group of customers that consider handling data and application servers a burden, you should not really worry about not being on the Cloud. Why? Because it will come, step by step, and I think you should let Oracle worry about that, not yourself. A first example is the integration of the new Oracle Cloud solutions with Siebel, that will extend your on-prem CRM features with cloud based ones, without the need for you to completely disrupt years of implementation. This is part of the Oracle CX strategy, that is offering you the possibility of choosing new cloud solutions such as Oracle Marketing, Oracle Sales, CPQ, Commerce, Service and Social to be integrated with the Siebel core. Numbers show us today that 84% of Siebel customers are either on 8.1 or 8.2 version; that means that - from now on - things should be much simpler in terms of innovation and upgrades and the official roadmap now clearly shows 2022 in the time line. So commitment is there... As for the quality of the products, I cannot really say and I don’t want to make everything appear so easy as it has not been in the past years for many upgrades (really painful for many customers). Open UI, firstly released 2 years ago, is now not just a reshaping of the user interface; it is really a change of technology, making sure that the Siebel application is not only more likable for the users, but ready to be run on all the latest devices. IP 2014 will make sure that there will be a complete responsive design UI, so that no development is needed to adapt the user interface to different devices. Using both tablets and smart phones? Then the UI will automatically shrink or expand to fit to your device screen. The third part representing an update and new life to Siebel is represented by mobile solutions: there will be now the possibility to directly download the mobile application from the App Store and the synchronization famous pain points will be approached (and hopefully solved) with 3 different options (complete synchronization, upload or download). The disconnected application will therefore see new life with an enhanced solution, together with a new version of CRM desktop, completely integrated with Outlook 2013 and Lotus Notes 8.5.3. Together with the standard mobile application, new ad-hoc vertical mobile solutions (phone or tablet) have been introduced: for the moment Communication, Life Sciences (particularly for e-detailing) and Financial Services will have completely dedicate mobile applications that will be integrated with Siebel (Open UI, of course). The fourth pillar of a potential Siebel renaissance (as our friend Bruce Daley has referred to at the beginning of this year -http://www.brucedaley.com/siebelobserver/2014/01/2014-the-year-of-a-siebel-renaissance.html) - and from my point of view the real indication that the Siebel team in Oracle is taking this seriously - is the introduction of a complete SRF and web templates free deployment (also called Run-time configuration) and a web version of the Siebel Tools that should allow you to do some basic customization of Siebel directly on the web browser, something similar to what you can do nowadays with Cloud platforms such as Salesforce.com. This is not something that will be available in the coming IP-2014 anyway, but should come from 2015 on. Of course this is a big change and will be released step by step, also because I am not totally convinced that you can successfully deploy all the current powerful Siebel configuration possibilities into a web browser: one of the limits of customization possibilities for cloud packaged applications (if we can define them so) relies exactly on this, in fact. Oracle future strategy aims at a so called Single Unified Tools on the web (weirdly very similar to our Unified Perspective approach) so that changes can be applied on an environment that is very similar to the end-user one. This unification should also bring new Optimized Testing capabilities for Siebel applications (Packaged Siebel Test Automation Interfaces and Objects). As you can see, lots of new developments should arrive to completely refresh the Siebel technology and this reinforces my point of view that on-prem or on the cloud, it is just a question of the technical evolution that an application is going through. Once your user interface is HTML5 compatible, your tools are web compatible, and you can rely on standard integration interfaces, the real difference between Cloud or On-Prem relies on the fact that data is on your own servers or on third-parties’. That’s really it! As for the timing for the commitment to do such changes, well... That’s a completely different story, and we could write an entire new article and discuss for days... My personal opinion is that these changes are at least 6 years late and that I am quite sure that around half of the lost Siebel customers in these years would still be on Siebel, if such changes would have been applied in a coherent time frame. I just want to finish this long post reinforcing the fact that this just represents my point of view on the current scenario and it is particularly referred to the long list of Siebel customers I talked with that are worried about the future of their CRM platform. As I mentioned, going to the Cloud could be the right decision for some, but for others I would say that right now they can look at their years of investment as an asset and not any longer as a liability. Above all, I always invite everyone to critically analyse what "cloud" really means, because at the end of the day the real important thing is that your piece of software is up to date with the recent technologies and the possibilities they offer, not where you store your data. e-Up successfully launched today! Follow us for news about Siebel and e-Tools. Standard support associated to your maintenance contract for Siebel has reached a very low-level in quality. Specialized support implies high costs and can lengthen the timelines due to response times and possibly losing control over your application. What if you had a Siebel expert always on your side, guiding you through issues discovery, indicating potential pitfalls, visuallizing alternative OOB design, reminding you wich requirements or which business processes are involved in a technical feature? What if all all this was real-time, 24/7, with no delay... and all automatically documented? e-Tools is your expert ally with automated Visual analysis based on Siebel design best-practices, extracted Business Processes, automatically generated Use Case scenarios. It is available any time you need it and it is always ready to tackle the issue together with you. No waiting time, no extra costs for premium service, no need to handle external access to your applications and data. Once identified the issue, make use of e-Tools automatic Visual analysis to infer both the requirement (thanks to machine-learning) and the existing design and bring on root-cause analysis. Once found the cause, developers and designers can work on a solution by visual prototyping. document everything with a click! Make the most out of your Siebel investment and be Oracle compliant by following Visual design best-practices. Increase agility: bridgethe gap between the business side of your company and your Siebel application. Support any Siebel version: use e-Tools continuously towards the life of your CRM application - we will release innovations together with Oracle in SaaS mode. Unmatched 24/7 embedded Siebel expertise - e-Tools holds best practices embedded in it’s automatic analysis, this facilitates keeping the team on the right technical track and supports solving old problems and defining new solutions. Maintain all knowledge internally - Create and own your "how-to" library and share it across the organization in html format - once modelled in e-Tools, processes, designs and legacy documentation can be shared on your intranet using already available resources for indexing and categorizing knowledge. Contact up to find out how you could implement your Siebel support with a simple, light, monthly fee. Is your Siebel implementation agile enough? Packaged applications, like Siebel, were meant to be agile, quick-to-implement and close to what the business requires from a corporate CRM. Unfortunately, wrong implementation practices have rendered them difficult and sluggish, very hard to maintain. A new trend, the Cloud, promises to make implementations easier, but the reality is that cloud simplifies deployment, upgrade and administration - while it does not offer an answer to the customization process, often complicating it with the return to custom code development. This actually amplifies the distance between business and IT. Employ the right approach to your implementation to get your Siebel business agile and aligned to your corporate strategy! Based on decades of Siebel projects’ experience and academic research, e-Up has distiled the best-practices for Oracle Siebel implementations in a simple yet effective methodology: a Unified Perspective methodology. Thanks to its visual approach, the methodology helps you construct a comprehensive perspective over your application, both functionally and technically. This means that both the Siebel team and the business have 100% control over what is available out-of-the-box, the existing customizations supporting the corporate business requirements, solution designs, issues - with all the knowledge surrounding your Siebel environment stored in one place, the e-Tools meta-repository, securely stored on your premises. e-Tools methodology is different from what you have experienced in the market so far! Every single approach tells you what to do, but only e-Up provides the comprehensive toolset to help you implement it. Having a methodology embedded in the tools you use makes the difference: e-Tools practices what it preaches. By simply using it, the Siebel team will be aligned with the business, achieving quicker implementations that deliver a CRM application that actually represents the corporate strategy. Do we need to give up our methodology and start all over again? NO. The unified perspective methodology guides your approach to handling Siebel, independently fromthe project management methodology you are employing. It provides the map to tackle and handle Siebel so that it answers your specific business requirements. The UP methodology can start from either your customized application and help you build on top of that (bottom-up approach), or start from the existing requirements and support you during the design process (top-down approach). This is why it is highly flexible and can be adopted in any moment of your project to bring in the desired results. In fact, all the visual artefacts - from business requirements to application solution design - can be interconnected, thus filling the gap between the functional and technical sides of a Siebel implementation and providing a common tool for your team's communication. You don't need to do anything on your side, just use e-Tools and you will be on the right track with a correct approach to requirement and process modelling, technical solutions design, team collaboration and project documentation. Why do we need a Siebel specific methodology? Siebel is the CRM enterprise packaged application by excellence. Packaged applications provide the advantage of having several features out-of-the-box, speeding up the implementation in comparison with custom greenfield development. The characteristic of a good packaged application, such as Siebel, is that it can be further configured and extended to meet any client needs. Unfortunately too often this has transalted into Siebel customizations over the top. They disregarded existing features and implemented "external" solutions, forcing the application behaviour. This resulted in heavy Siebel applications, hated by their users. When implementing Siebel the right way, making the most of what is already there, using the customization mechanisms as they should be used, Siebel is more agile! By using e-Tools your team automatically employes the methodology, thus applying best practices on all the projects phases and reusing the exact core Siebel elements that compose your corporate CRM application! This is what the Unified Perspective offers. Contact us to learn more about the Unified Perspective methodology. - Siebel specific - it is dedicated to Siebel and its specific handling, thus make use of the Siebel core objects of your application. - Visual - Why Visual? Because visual information is processed 600,000 times faster than text, it is language independent (thus reduces misunderstandings), simplifies the overview so that all stakeholders can be aligned on the situation. - Automation - Why spend time on repetitive tasks? Navigating and searching for information to construct an analysis? Automation reduces repetitive tasks and provides more time for bugs identification or creative solution finding. - Reusability - Have you noticed how documentation tends to be repetitive? Are you sure your requirements are reflected in the design and testing documentation? Training materials are built based on requirements specifications and process design? What if, once modelled, you could reuse the knowledge in different formats? This reduces workloads and streamlines work in the Siebel project, so that more is done with less. - Communication and collaboration - Did you know that the main pain points for a project delivery are misunderstandings? Clear up the air and have everyone on the same page, by employing visual representations and one knowledge repository referenced by all. - Agility - do it right so that the implementation work and the application itself are agile! - Real support - e-Tools sustains the methodology in every step and was built in respect of the above principles. Many Siebel professionals are becoming e-Up certified to demonstrate their skills and abilities. Would you want to be an innovative and recognized Siebel professional? Start your certification process, contact us! While working with e-Tools, a knowledge repository of your Siebel application and implementation is built behind the scenes. Requirements, designs, test scenarios, issues and bugs and their solutions, functional processes... everything is interrelated so that you can keep track of what is going on. Automation and innovation meet to facilitate analysis and management. Moreover, e-Tools introduces innovative support for working with Open UI such as the dedicated editor (with intelisense), rapid prototyping and live script testing. Why is e-Tools different from any support tool you might be familiar with? It is special because it is not just a tool: the Siebel-dedicated methodology is embedded in e-Tools, guiding your strategy throughout the project. Automation and visuanalysis, based on condensed knowledge from decades of Siebel implementation projects, support the team to speed up and make more agile the development process by reducing workload. Find out more about e-Tools, but if you want to find out what it can do for you, contact us for a dedicated case-study.